I started this room makeover by putting up a board and batten wall. These wood slats come in 8 foot lengths. They run about $6.96 each, they are 2-1/4 IN x 8 ft. they are pine lattice slats. They did need to be sanded in a few spots to make them really smooth. I nailed them up after measuring and taping them to the wall first. Caulking came next-do not skip this step! Caulking is your best friend, trust me. it fills in all the gaps and any mistakes and makes them non existent. Then the primer and paint. I did this wall in 2 days, by myself. As you can see in the picture below the slats are the same width as my baseboards so I didn't need to do anything there. I just budded it right on the top of the base boards, made sure they were level and done. This is after one coat of paint. It took 2 coats of paint to get it all covered. I love how much the bright white wall brightens his room. His bedroom window is under our front covered porch and so it never gets direct light so it is a bit darker than the rest of the house. My son loves how his room turned out. HERE This 4 piece white sheet set from Bluebird Linens is so great. I have several sets and they are so soft and wash up so well. You can get 30% off your order with the code "countrygirl" How awesome is that! I wanted to add some special art work or picture. I purchased this wood frame from Target and had one of my photos blown up from the mountains where our cabin is at. This is one of our families favorite places to hike and go fishing at in the summer. Thanks for stopping by. I hope you are having a good day! Once your go Beddy's you can never go back! I'm not even kidding you guys. This bedding is amazing. I've said it about a hundred times! I won't lie to you, this bedding is so easy to zip up and down. Your bed will never look messy again. The style I chose for my 11 year old son was the Modern Gray All Cotton. It's the perfect medium gray color. His Beddys bedding goes perfectly with the newly painted nightstand. My son is a huge sports fan. I wanted to keep things simple and bright in his room. Each bedding set comes with one coordinating pillow case and a decorative sham. Just look how cute the inside is! This bedding is so easy to use. there are 2 zippers on at each side of the bedding. You can zip one down or both. You can get all cotton like this one or Minky inside. My boys have a habit of just pulling their comforter up over the messy sheets and that leaves a bumpy, messy bed and that drives me crazy!! With Beddy your don't get the lumpy bedding! Hip, Hip Hooray! My kids, and even me for that matter can never quite get the sheets and comforter straight. and I have spent about 15-20 minute getting it all straight just to have it a big mess by morning. Beddy's really are a hug time saver for me and my 4 kiddos. Now the other 2 boys want their own set of beddy's on their bed. This post is in partnership with Beddys Beds. All opinions are my own. I really do love all things Beddys. I have had the best time decorating my new open shelving in my dining room. It's the perfect place to display all my white dishes and pretty cake plates. My favorite wood and marble cake stand from Rod Works gets moved all over my home. I love it so much! The real paper whites I grew finally died so I replaced them with these faux potted ones from Pottery Barn. White canisters and white pitchers are from Walmart. Spring and Easter and some of my favorite times to decorate. I love using fresh flowers and bright happy colors. Some real yummy smelling flowers add some Sringtime feels to my kitchen. I hope your enjoying your Spring! Do you love open shelving as much as I do? I've been wanting to do some in my dining area for a while now. Last week I was able to get them made and put up. It did take me a few days to stain the shelves, paint the corbels and then another day to get everything hung up. All that time and effort was worth it, what do you think? First I used Minwax wood conditioner on the boards, then I let it dry. Next I stained the 1x8x4 boards with a mixture of Minwax Weathered Oak and a little bit or Dark Walnut. I didn't want any sheen on the shelving so I used Minwax clear finishing wax to seal the boards. I painted the corbels a bright white. I love the pretty contrast between the wood and the white. 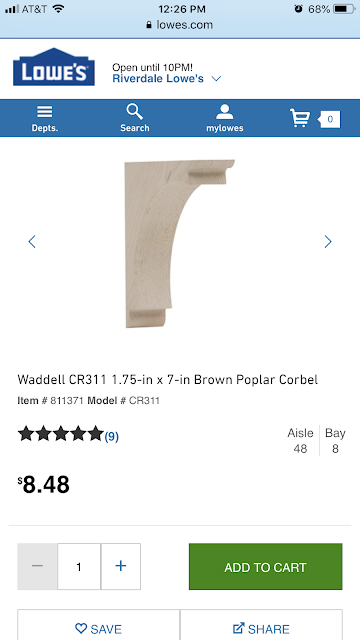 It took me a while to find the studs and hang the corbels the same length. It would have been easier to have some help doing this but I'm too impatient to wait for my husband or sons to get home so I just did it myself. After making sure the corbels were level, I placed the wood shelving on top and screwed them into the corbels for stability. I love having another place to display my pretty white dishes and cakestands. These are the corbels I purchased from Lowes. They have a few different sizes. This whole project cost me under $60! Do you wanna know the best inventions since sliced bread? Well you're in for a treat! Beddy's Bedding is the BEST invention ever! This bedding makes making your bed a breeze. I've always made my bed everyday and so when my children were old enough I taught them how but with their little hands and arms its always been really hard for them. My daughter had the hardest time making her bed. Sometimes it brought her to tears in the morning because she got so frustrated. Along came Beddy's zip up bedding! Seriously your guys these are a moms best friend. Just look at that heavy duty zipper! The quality of these bedding sets is unmatched. The zippers go up and down with such ease. Bed*ease see what they did there? It doesn't matter how clean your room is, if your bed isn't made it still looks messy. Don't you agree? Beddy's has the choice of cotton or Minky inside. We got the Chic White with the Minky inside and it is so soft and warm. My daughter loves it! Be sure to go to Beddy's to check out their other styles of zippered bedding, blankets, and throw pillows. Now my daughter can quickly "zip" up her bed every morning and there have been no complaints at all! That saves me some serious time in the morning. If you are interested in saving some time and making your children's and your bed making experience easier use the code COUNTRYGIRL for 20% off your Beddy's purchase. Hello, I am so glad you're here! If you're new around here my name is Lindsay. I was born and raised and currently live Utah. I love Utah so much but I am ready for winter and the snow to be gone already. I am in full blown Spring mode. Tulips and Daffodils remind me of when I was young and they would pop out of the ground and let me know it was Springtime. So tulips are the perfect centerpiece for my happy Spring tablescape. These are faux tulips purchased on Amazon. They look so real, don't ya think? So while I was putting this tablescape together I thought to add some blueberries to the lemonade. Dang! It could be my new favorite drink! I have always added strawberries or raspberries to my lemonade but never blueberries! Try it its soooo yummy! The wood chargers are a DIY purchased from Michael's in raw wood and then I stained them. Same with the cutting board. I am loving blue latley can you tell? I just reminds my of the beautiful blue sky in the spring and summer time. Its such a relaxing color for me. I love Blueberry muffins and so do my kids so I whipped these up for them for after school and decided to use them for my tablescape. I'm all about multi tasking! Wood napkins rings are from Amazon. I think they are so cute and will go with so many different tablescapes. They were $10 for 6 of them. I love these little tulip muffin/cupcake papers I got from Amazon! They just make the muffins look a little more special and homemade. When I saw they were called tulip paper liners I had to have them. No these blueberry muffins are not from scratch, But they are from a box and I did add the ingredients so in my book that's homemade. I hope you've enjoyed my Spring tablescape. Today is the first day of Spring and I am so excited about it! I hope your having Spring weather where you live. We are until tomorrow.